Welcome to Orange Nails Salon ! 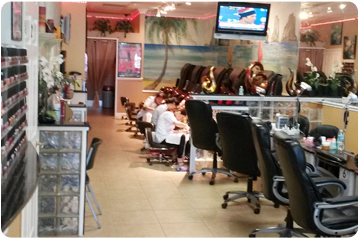 Experience the best nail care services from our salon in Orlando, Florida. The technicians at our Salon treat you like royalty when it comes to nail services. We pride ourselves in providing our customer with fabulously indulgent nail care while maintaining the highest level of cleanliness and sterilization. When it comes to safety, we take it very seriously. We don’t reuse files, buffers, pumices. Our spa chairs and all instruments are disinfected and sanitized prior to each use according to Florida State Board regulations. We have lots of products to go deeper care than just nail and coloring, there are many choices for you with hundreds of gel colors. You are freely to enjoy your time at affordable price! Our staff has the skillful experience and understands your demands. That’s reason why we focus largely on maintaining customer relations in an attempt to provide you with the highest degree of services. You can either make an appointment with us or simply walk through our doors for an experience of a lifetime. We do SNS Nails Dipping Powder. Bring to you natural and healthy nails. NEW SERVICE: We do SNS Nails Dipping Powder. Bring to you natural and healthy nails.